Massive crowds packed into D.C. Metro stations Saturday night as thousands of participants in the Women's March on Washington headed toward the White House and dispersed from the National Mall. Metro urged people to consider waiting before riding to allow the crowds to ease. Fairfax County police also advised riders to follow police direction. Metrorail has seen more riders on Saturday than it did for former President Barack Obama's second inauguration in 2013, reports News4's Mark Segraves. Stations were packed and more than a dozen parking facilities were full before noon Saturday as hundreds of thousands of participants headed to downtown D.C. for the Women's March on Washington. Trains briefly bypassed the L'Enfant Plaza station due to crowding. They began serving the station again shortly before 1:10 p.m. Officials recommended riders use other stations to get to the march, such as Gallery Place or Metro Center. Posts on social media Saturday showed long lines of people waiting for access to Metro stations. Multiple people shared images and videos of the scene outside the Shady Grove, where Philip Lewis of the Huffington Post reported earlier Saturday that he was hearing riders were waiting an hour to board trains. March organizers said they've increased turnout estimates to 500,000 participants, said D.C. Deputy Mayor for Public Safety and Justice Kevin Donahue. "Be patient & kind!" he posted on Twitter. 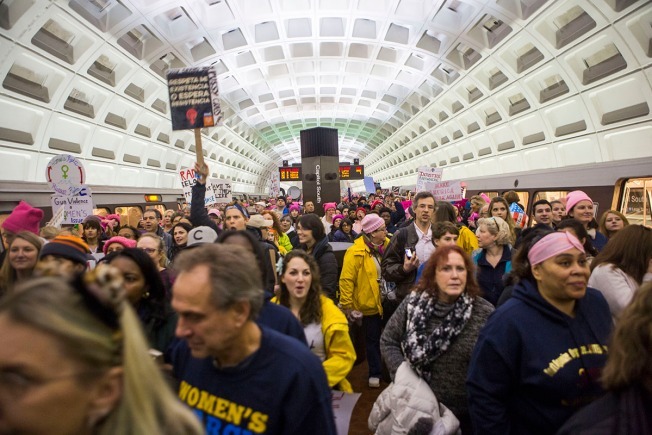 Many Metro stations were flooded with travelers trying to get into D.C. for the Women's March. News4's Adam Tuss reports. It's been a busy day for Metro. Officials said 275,000 rides had been taken as of 11 a.m. "For comparison, that's more than 8 [times] a normal Sat[urday] & even busier than most weekdays," Metro posted on Twitter. 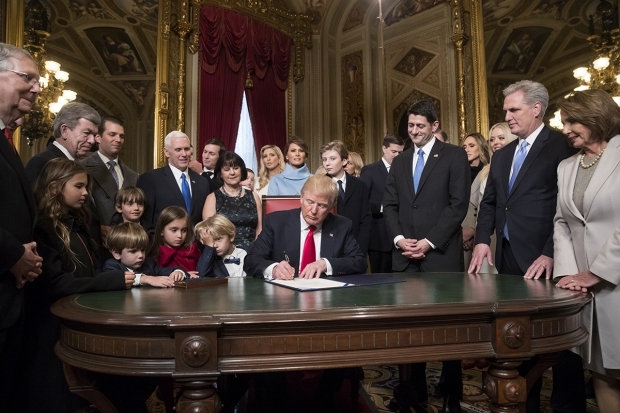 As of the same time on Friday, Inauguration Day, 193,000 trips had been taken. Metro station personnel were making adjustments to try to accommodate the large crowds. At the Ballston and Stadium-Armory stations, would-be Metro riders were stopped before the escalators because too many people were already on the platform Saturday morning, reported News4's Adam Tuss, who said it "cannot be overstated how heavy the crowds are." 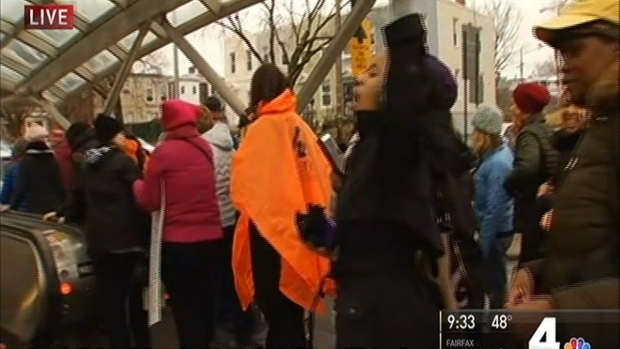 Metro stations are packed and more than a dozen parking facilities are already full Saturday morning as tens of thousands of participants headed to downtown D.C. for the Women's March on Washington. 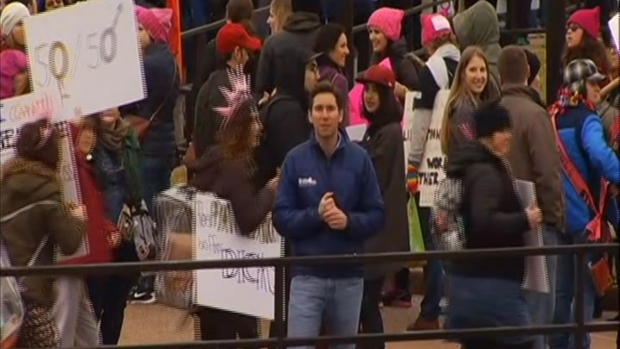 News4's Adam Tuss reports. Melissa Zieve of Baltimore said she had to let the first two trains at Tenleytown pass by because they were too full. She was able to board a third train and rode to Union Station. "I've never been on a subway in any city packed quite like that," Zieve said, but added that everyone was respectful and no one was pushing. As of 10 a.m., Metro was recommending the following stations with available parking: Branch Avenue, Grosvenor, Prince George's Plaza, Southern Avenue, Suitland, Twinbrook and White Flint. Outside the filled Greenbelt and New Carrollton lots, drivers have been illegally parking on the shoulders of the ramps leading to the Metro stations, according to the Maryland State Highway Administration. Metro had initially planned to keep the Federal Triangle station closed throughout Saturday, but reversed their decision and reopened the station about 9:20 a.m.
Riders may also consider exiting at the Federal Center SW or Capitol South stations. Margaret Warpeha from Minnesota flew in Friday night and described her Metro experience as wonderful Saturday morning. She boarded at Silver Spring about 9 a.m. and said it wasn't too crowded. Warpeha said she wanted to come to D.C. because she was "quite upset" about the election and didn't want to remain silent. Outside Union Station, Lisa Legrand of Minneapolis said she flew into Philadelphia, drove to the Tenleytown station and rode the Metro downtown. "It was really crowded" but had a very positive energy, Legrand said. Orange/Silver Line: Expect delays to New Carrollton & Largo Town Center due to a disabled train at Virginia Square. Orange/Sliver Line: Expect delays to New Carrollton & Largo Town Center due to a disabled train at Virginia Square.